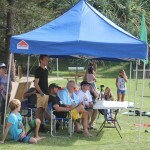 14 April 2013 – Fun waves for the Kirra crew competing at club round 3 on Sunday 14 April 2103. 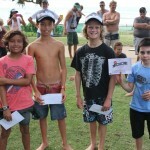 With Kirra point & D’bah too big for the majority of the groms & cadets the comp was set up at Rainbow Bay providing 3-4 ft smooth conditions and long rides from Snapper across Rainbow Bay and into the start of Greenmount. 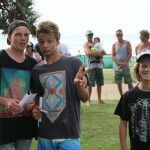 Despite the Sunday funday crowd all the crew managed to get some great waves and turn it on for the crowd. 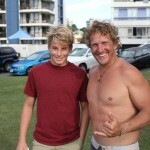 Standout surfer of the round was 12 yr old Seth Johnson competing in his first Kirra comp this year and carving some great turns. 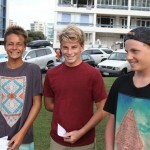 He won the Groms division paddling into some solid waves and then took 2nd place in the final of the Cadets (U16 division), beating many of his older competitors. Well done Seth!! 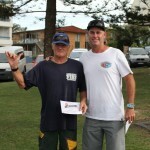 Finally thanks to all the parents and kids who judged across the day and Jenny, Amy and the crew for preparing and cooking the BBQ to feed the hungry surfers & judges.